Long gone are the days when the only vegan shoes you could find were horrible, plastic monstrosities that made your feet sweat. And soon, hopefully, gone too are the days where the majority of vegan textiles are made from either water-hungry cotton or ocean-destroying plastics. There are so many new materials being developed from a huge range of raw materials and used products, whether itâ€™s waste products from the food industry, animal free leather, or yarn made from tree bark. Letâ€™s delve into the weird and wonderful world of these sustainable new materials! As the name suggests, Orange Fiber is made from byproducts from the citrus juice industry. Produced in Italy, which creates over 700,000 tons of this waste a year, Orange Fiber uses what is left behind from juice production and turns it into fibers, which are then, using nanotechnology, made into silk-like cellulose called pastazoo. The pastazoo is then either spun with other fibers or used to make 100% citrus fiber clothing. Again, the pros of using waste products from an already established industry means that no more land, pesticides, or water needs to go into growing the oranges for these textiles, and itâ€™s not a rival to the food industry. Using waste products is a more environmentally friendly alternative to using other man-made cellulose fibers, such as those made from wood or hemp. Orange Fiber was patented in 2014 and since then, theyâ€™ve created prototypes, gone into production, and released their first collection on Earth Day in April of 2017 in collaboration with Mario Trimarchi (photos below). This capsule collection â€” daily wear perfectly suited for summer â€” was filled with pieces that are said to have a silk-like texture you have to feel to believe. The main component of leather, whatever animal itâ€™s from, is collagen. But Modern Meadow is a team that wants â€œa future where animal products are animal free,â€� and so they worked on growing the collagen needed for leather with machines. That might not sound like the easiest process, and itâ€™s not, but with an incredibly versatile team of designers and scientists with 11 PhDs between them, theyâ€™ve successfully grown animal leather without the animals. First, they take a base pair of DNA, the stuff that tells organisms how they function, and cut and replace these base pairs to make new unique strands of DNA â€” this means they tell cells to make the exact type of collagen needed. Then they put these new DNA strands into cells which multiply; these cells produce the protein collagen, which group together and create collagen molecules. These collagen fibers group together and create fiber- like strands which Modern Meadow processes further into their materials to be tanned and finished. Incredible stuff. Not only does this process mean a cruelty free animal leather, but it also reduces waste by up to 80% compared to traditional leather. Because the leather can be grown to the shape and size desired and without the use of animals, thereâ€™s reduced use of land, water, and energy. Plus, as an added bonus, the leather can be designed and engineered specifically to have the right texture and aesthetic needed â€” something that canâ€™t be done when using animals. Back in September of 2017, Modern Meadow finally released their first prototypes to the public revealing their brand Zoaâ„¢, and this January were part of the Museum of Modern Artâ€™s â€œItems: Is Fashion Modern?â€� Theyâ€™re doing things with their leather that isnâ€™t possible with traditional animal leathers, including the use of liquid leather, which sounds like sci-fi stuff to me. Currently Zoaâ„¢ is collaborating with other brands working to grow products set to release later this year. 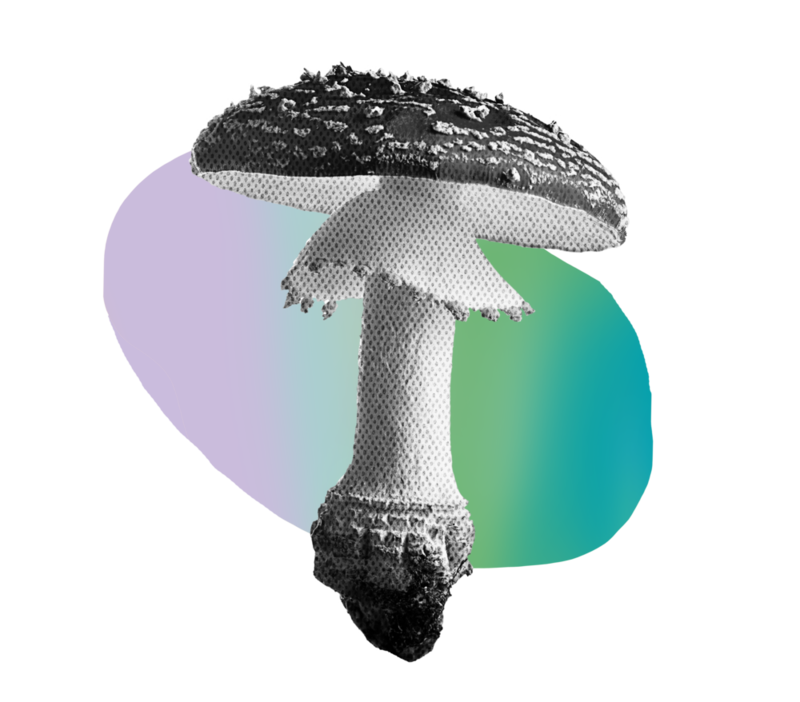 MuSkin is a play on words â€” thatâ€™s right, itâ€™s mushroom leather alternative time. Created by Italian company Gardo Zero Escape, MuSkin is a 100% vegetable layer alternative to animal leather, made from Phellinus ellipsoideus, a kind of big parasitic fungus that attacks trees in subtropical forests. Unlike a lot of mushrooms, Phellinus ellipsoideus is totally free from toxins and actually limits bacterial proliferation and so is perfect for use in clothing and accessories. Though it is an edible mushroom, itâ€™s probably best not to try eating this fabric (but then again, most fabrics arenâ€™t really fit for consumption). Itâ€™s made by growing mushroom spores into a close, woven pattern â€” these spores are taken from the mushroom caps and processed similarly to how animal leather is processed. However, since this system is completely natural, the dyeing process strays away from the harmful toxic chemicals that are often used in treating animal leathers. MuSkin has a touch similar to suede, only softer, and itâ€™s 100% vegan â€” plus itâ€™s 100% biodegradable. Currently, the company making MuSkin can only produce 40-50 square meters of the fabric every month, so this material isnâ€™t something that is going into mass production any time soon. And though you can buy it in its material form on the Life Materials website, there doesnâ€™t seem to be any collections being sold currently that are made of MuSkin. But hopefully one day youâ€™ll be able to buy a mushroom leather bag or skirt. Eucalyptus yarn. Sounds like traditional yarnâ€™s cool hipster cousin, and it kind of is. Traditional yarn is usually made from a blend of cotton and polyester â€” the first being a very water-and land-hungry crop, the latter being made from natural gas and oil. Tina Tapeâ€™s eucalyptus alternative, TencelÂ® is made sustainably of wood harvested from eucalyptus trees. This wood is turned into a pulp and then spun into a yarn. Not only does it save the environment a lot of hassle in making, itâ€™s also biodegradable so it wonâ€™t be contributing to landfill like most of the fashion industry! You can currently buy Tina Tapeâ€™s collection of knitwear from Wool and The Gang, which are super stylish and come in a pretty big range of colors. The DIY catch is that theyâ€™re not sold as already-made pieces â€” you get the yarn, knitting needles, and a guide, and you knit/crochet the pieces yourself. Their yarn is also available on other knitting and crocheting sites. Hopefully, for those less capable with knitting needles, Tina Tape will be used and sold in fully made pieces one day soon. All of these innovative and sustainable new fabrics give me hope that one day, we can move away from not only materials that are extremely harmful to the environment and wildlife, like plastic, but away from materials that use animals, like silk and wool, at any point in their production; as evidenced by these fabrics, it is possible. Letâ€™s support these companies and others like them and watch the world of sustainable textiles grow! The cover image is from the runway show of Thom Browne, Spring 2019. Weâ€™re cooking up vegan Korean street food with a dash of nostalgia.